Incredible build quality and a great room calibration system, all matched by the price. Fabulous build quality. Highly effective DSP management system. Stunning mid and HF dispersion and extremely linear at all volume levels. Sound lacks a little upper-mid range 'bite'. Expensive. The name Genelec has been synonymous with high quality monitor systems for a very long time. It's highly unusual to find a major studio complex without at least one pair of their speakers somewhere in the building, be they smaller desktop types or monster wall mounted systems. The 8260As are big beasts. They are easy to set up and position as the incorporated Iso Pod that they stand on is simply positioned and has the added advantage of decoupling the speakers from their mounting surface while the cabinet itself is made from die-cast aluminium. Its unusual shape is a result of Genelecs research into acoustically optimising all aspects of their enclosures, including rounding edges for minimum diffraction. They look almost like a piece of minimalist sculpture and certainly pull no design punches. The bass driver is covered with a metal grill which follows the driver's contours and echoes the curves around the upper frequency drivers. To the rear is a port at the top of the cabinet and the connector and control panel is just below the middle. Whether you like the way they look or not (and we do) these are beautifully built. The cabinets are rock solid and there's excellent attention to detail throughout, our only slight criticism being that the connector panel feels a bit crowded. 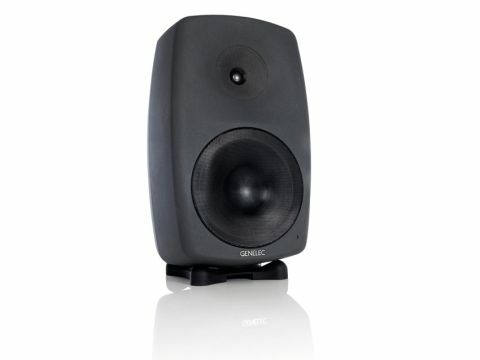 They are a three-way design utilising a 10-inch bass driver and Genelec's own minimum diffraction coaxial mid/hi driver (MDC) which gives a very even and extremely accurate on and off axis response. They can be fed with a digital (AES) or analogue input via XLRs and the DSP section is controlled by connecting a computer with the GLM (Genelec Loudspeaker Manager) software installed, via the CAT5 ports on the back. GLM allows you to align your speakers and store the responses so that, if you move around a lot as many engineers do, you can recall the response curve for the room you are in. Having aligned them, the onboard DSP stores the setting so the computer doesn't need to remain connected. We have to admit that we have never been great fans of the Genelec 'sound'. We have tracked quite a few albums on various models and mixed a couple too. Our general feeling has always been that they lack a bit of detail in the upper midrange, just about where the bite is. The 8260As are no different. They create a big smooth sound. Softer acoustic material and R&B sound great but as you start to put Rockier stuff on you begin to miss a bit of edge and in some cases the balance can sound quite different. The plus side is that the imaging is stunning and because the coaxial drivers do what Genelec say, moving around the room is never a nasty shock. The mids and highs are always there and even standing far from the centre you still get a strong impression of the stereo image. The sound of the 8260As may not suit everyone but there are certainly enough professionals out there that swear by them to know that these are monitors of the highest quality. We find the price a little high, but it does reflect the stunning build quality and the useful alignment system, if not the overall sound.